This article will show you how to configure Captive Portal with Radius Authentication in Linksys LAPN300 or LAPN600. Follow the instructions below to learn more. Make sure that the firmware version of your Linksys LAPN300 or LAPN600 is 1.0.14.001 or above. If your access point doesn’t have the latest firmware, download the file by clicking here for Linksys LAPN300. For Linksys LAPN600, click here. 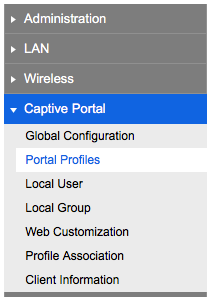 Open the web-based setup page of your LAPN300 or LAPN600 and select Configuration > Captive Portal > Global Configuration. On the Global Configuration category, check the Enable box and click Save. Click Portal Profiles under Captive Portal. NOTE: A profile is a defined set of login authentication, landing page, redirect after authentication, etc. for your Guest network. The system supports up to two (2) profiles. Select a Profile Name from the Captive Portal Profile. There are two (2) pre-defined Profile Names in the drop-down list. Select one (1) and go to the next step. NOTE: In this example, Profile 1 is used. 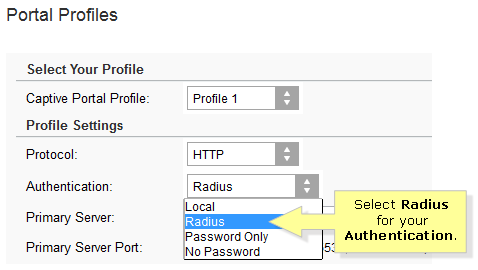 Select Radius for your profile’s Authentication. Fill out the necessary information on the page. 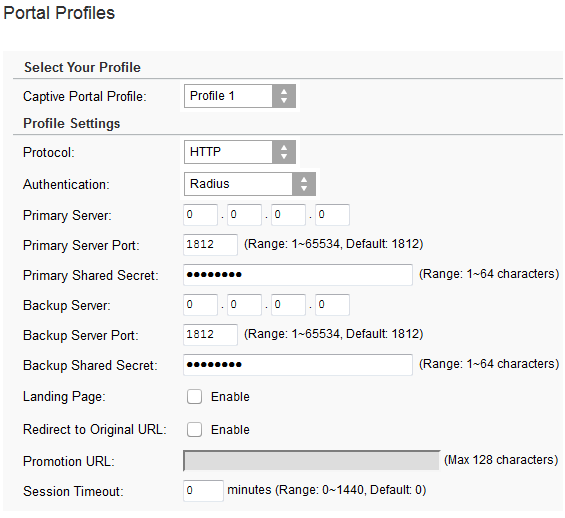 Primary Server – Enter the IP Address of the Radius Server on your network. Primary Server Port – Enter the port number used for connections to the Radius Server. Primary Shared Secret – Enter the key value to match the Radius Server. Backup Server – The Backup Authentication Server will be used when the Primary Authentication Server is not available. Backup Server Port – Enter the port number used for connections to the Backup Radius Server. Backup Shared Secret – Enter the key value to match the Backup Radius Server. Manage the username and password accordingly in your Radius Server. Refer to your Radius Server’s user manual for instructions. NOTE: You can also use different application tools that are available for free to help test and monitor your Radius Server. These are very useful especially when you need to troubleshoot. One example of this is NTRadPing. To learn how to use this application, click here. This kind of tool will help to rule out where it went wrong when user cannot grant Internet access via Captive Portal SSID with Radius Server authentication. NTRadPing is not a Radius Server, it is a testing tool to verify against your Radius Server configuration.